Purchasing this item will earn you 170 reward points (Reward Points Rs. 17.00) ! Purchasing this item will earn you 170 Rewards points (Rs. 17.00) ! 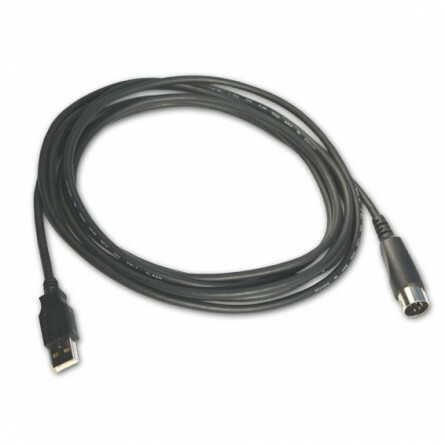 A very useful Midi to USB cable manufactured by Magnum. Piano is one of the most tender musical instruments ever created – the soothing melodies one could play with it know no bounds, and it’s not a coincidence that you want to become a piano player yourself. We’re here to talk about digital pianos in general – what they are, and what you should know before purchasing one, among other things. What is a digital piano – how is it different from the acoustic piano? Basically, a digital piano resembles a traditional piano (acoustic) – all models have “keys” which sound more or less the same unless certain effects or modes are used, but the truth is, digital pianos are far more versatile. Most of us have had the opportunity to try a traditional piano during school music lessons, but even those that didn’t could see one in stores or movies. The first thing that comes to mind when you think about an acoustic piano is a scene where the player sits while playing because these instruments are very large. Traditional pianos are not just bulky – they weigh quite a lot too. The first difference between them and digital pianos is that the latter are neither too big or too heavy. Storing a digital piano at home or in the back of your car will be far easier when compared to storing an acoustic piano. Even though acoustic pianos sound unique and exquisite, digital pianos (in virtually all cases) come with different modes and effects. These effects intend to simulate various other instruments or combinations of instruments, allowing you to produce any number of sounds. Speaking of combinations of instruments, some digital piano models have combo effects, such as octave+bass or strings+piano. Recording the sound of an acoustic piano can be done, but it’s a lot of work. Most musical producers do so by placing an overhead microphone just above the piano, and that usually does the job, but the tricky part is the reverberation of the room, the sound bouncing on and off – one miscalculation and the sound might appear too bright or too dull. So, in a nutshell, acoustic pianos are very hard to record. On the other hand, most digital piano models come outfitted with at least one connection port, allowing you to plug it in your PC, mix, or whatever unit you are recording on. People who have never played piano before usually think that this instrument is quite easy to play. The fact is that it’s not – that’s why personal tutors and teachers are engaged, which, unless you have a pro friend, will cost you dearly. Now, most digital pianos come outfitted with a set of “learning tools” – special features which aim to help you handle the basics in the easiest way possible. These learning tools include a metronome, which is basically a ticking timer which will “tick” at intervals you specify, backing percussions, which will allow you to “jam out” and practice more easily, and others. Surprisingly enough, most Digital pianos are less expensive than acoustic pianos. They’re easier to maintain, and they are usually built from more affordable materials, which is just one of the reasons why they don’t cost so much. Actually, the sole reason why acoustic pianos are so expensive is because they’re built in a very unique way – the process requires heavy machinery, and the technology simply isn’t developing in the way that promotes the manufacturing of acoustic pianos nowadays, so each model has to be expensive, otherwise the brands would give up on them. Digital Piano Brands – who should you trust? There are many names in the piano making industry – Roland, Casio, Kawai, and of course, Yamaha. The reason why you should be well informed about the big guys is because there are also plenty of underdog brands which offer you mediocre-quality models at basically the same price. For instance, there is a plethora of high-quality pianos to be had for $100 - $200 from Yamaha’s stocks, so why even consider going with some low-reputation brand? You’ll want to buy Yamaha digital piano for several reasons – these guys have been around for approximately 130 years, and that alone gives them enough credibility for us to conclude that they’ve did a very fine job. Yamaha’s world-class “PSR” series includes dozens of premium-quality digital pianos, some of which excel in quality, others in versatility, some in both. One thing is certain, though, you simply can’t make a mistake if you get one of their pianos. What’s best about them is that you can order Yamaha Keyboards online with but a simple click – you don’t actually need to ride all the way to Asia. Casio, just like Yamaha, originates from Japan, and they’re a bit younger (founded 72 years ago in 1946). They boast a huge catalogue of top-shelf products, so if you’re looking to order some Casio keyboard online, we warmly support you. Some of their most renowned digital pianos are Privia, Privia Pro Stage, Celviano, and CDP, so make sure to check them out if you have the chance. Again, we’re recommending that you give a shot to a Japanese electronics company – Roland was founded in Osaka, Japan in 1972. Even though Yamaha is nearly twice as old, Roland is a big name on the digital piano scene. Their V-piano, RD-2000, RD-64, as well as the entire FP series earned quite some fame among professional piano players, so if the veterans liked them, there’s no reason why you shouldn’t. If you’re a beginner piano player, it’s good that you’ve come here – there are plenty of things you will discover in the vast musical world, and we’ve shared but a portion of what’s yet to come your way. Choosing the perfect digital piano for you is one thing, but knowing what they are like and why you should consider them is perhaps even more important. Yamaha Corporation (or shortly just “Yamaha”) is one of the most renowned multinational Japanese hardware brands. Everybody’s heard of them in one way or the other, but there are a couple of peculiar things about some of their merchandise. If you want to take up an online search of Yamaha’s “best products” online, you’d get a plethora of lists, bullet points, recommendations, and whatnot. However, certain “series” of their best-quality products aren’t so easy to categorize. For instance, their PSR series is a bit tricky to understand, as it features all kinds of keyboards – beginner’s, advanced, high-end, and boutique. Yamaha Corporation (or shortly just “Yamaha”) is one of the most renowned multinational Japanese hardware brands. Everybody’s heard of them in one way or the other, but there are a couple of peculiar things about some of their merchandise. If you want to take up an online search of Yamaha’s “best products” online, you’d get a plethora of lists, bullet points, recommendations, and whatnot. However, certain “series” of their best-quality products aren’t so easy to categorize. For instance, their PSR series is a bit tricky to understand, as it features all kinds of keyboards – beginner’s, advanced, high-end, and boutique. Since Yamaha is “responsible” for numerous high-quality products (and series where they belong), the simplest of researches would end up as a small encyclopedia, we are going to discuss mainly the PSR series of Yamaha’s finest keyboards, as well as the PSR workstation series, so as to avoid confusing the latter with the former. Yamaha earned much fame during the course of years, but it’s safe to say that their plain keyboards had a lot of impact on their renown. Before they’ve buckled up their staff and improved their technology, they’ve been manufacturing basic 61-key keyboards. These models are very plain in their essence, but there’s a staggering number of differences between each one. The main reason for that is the increase in Yamaha’s staff, improved technologies, and so on. Let’s see what Yamaha’s PSR series feature. What is the series comprised of? Yamaha’s work with the PSR series started in the year of 1990 with the PSR-2 keyboard. It’s safe to assume that a PSR-1 existed at some point in time, but no credible sources can confirm it. After the PSR-2 came the PSR 3, then the 6 coming with 49 keys and 100-sound bank. Ironically, the Psr-11 featured only 16 sounds – it was developed three years before the PSR-6, so it’s only logical that it’s inferior in performance. There were approximately a hundred (discontinued) models before the major breakthrough – the PSR-1000 which was released in 2001. All of the aforementioned keyboards were surprisingly similar in both design and performance, with minor improvements in the sound-banks and playability, but it all changed with the PSR-1000. This particular keyboard model started a new generation of high-quality keyboards which excelled in numerous fields of performance – they didn’t cost much, and they all boasted a superb value due to excellent sound emission and clarity. This particular category is not a sub-category of the PSR series – it’s completely standalone and comprised of keyboard workstations. A keyboard workstation is, basically, a combination of a regular keyboard, a special music sequencer, and lastly, a sound module. These stations feature massive “tablas”, and the features they come supplied with aren’t so easy to figure out, which is just one of the reasons why beginners and immediate newcomers shy away from them. Even though there are numerous differences between each PSR keyboard, it’s safe to say that they all have the PSR-1500 to thank for the original design. All later models are improvements and only feature upgrades rather than significant reworks and tweaks. What is the PSR arranger workstation series comprised of? Yamaha’s PSR “workstation” series started with the (now discontinued) PSR-1500 arranger workstation which was released on 21st of January 2004. It was replaced and improved in mere weeks with the model 3000 which appeared as a pioneer keyboard at the time. It featured a staggering amount of 997 voices, some 58 drum and SFX kits, a total of 480 XG voices, and up to 400 styles for you to choose from. The next model was the PSR 7000 – a reliable, highly versatile arranger workstation with a plethora of options and styles. The PSR 8000 and 9000 followed in the course of next two years, only to be replaced by the PSR-9000 Pro in the year of 2000. It’s safe to say that the PSR series earned its fame and glory with the start of PSR-A models (such as PSR A2000, PSR A3000, and such, both of which have surfaced by the end of 2010). Some people call this sub-category of PSR workstations as oriental workstations, as they were exclusively sold in certain oriental countries – one of the most famous “oriental” PSR arranger workstation was the I455, but we’ll talk about it specifically in one of the sections below. Apart from the original PSR, Yamaha started manufacturing the PSR-S workstations in July 2006. These “S-Class” arranger workstations are predominantly used and favoured by professional and advanced keyboard players. Needless to say, the PSR S keyboards are substantially more versatile, come outfitted with an increased number of voices and styles, but they also cost quite a lot in comparison to the models from the “original” PSR series. Now, we already mentioned that PSR arranger workstations aren’t so well suited for beginners, but regular keyboards from the PSR series are practically ideal for them. While only veterans are capable of utilizing the unwieldy design of a workstation, models that belong to the “original” PSR series are plain and straightforward. The PSR-E series is among the most versatile ones, featuring hundreds of authentic voices, numerous GM panels, and a plethora of built-in songs and music databases. It’s absolutely perfect for beginners, but even intermediate level players will have fun with it. There’s a very special sub-category of PSR keyboards called the “PSR Others” by some sources – the keyboards within this category share so very little in common that there’s no firm ground for further categorization. According to Wikipedia, the PSR others is comprised of PSR I455, I425, A3, D1, GX76, K1, and F51. The I455 is the latest addition to this group, and it’s safe to say it sticks out from the rest. Now, PSR-I455 was built exclusively for the Indian market and it features 753 voice packs, 206 built-in music styles, and more – 19 of which are Indian instruments and 26 Indian-themed automatic music accompaniment. Simply put, Yamaha’s PSR series is vast. There are numerous smaller sub-categories within it, and keeping track of all the models that ever existed in this generation is virtually impossible. However, flagships such as A1000, A3000, I455, and E333 shouldn’t be overlooked if you’re ever in search of a premium-quality high-end keyboard. Last note, though – don’t confuse PSR series with the PSR workstation series, as they’re not one and the same. Choosing the piano, keyboard, or synthesizer that’s right for you depends on a variety of circumstances. First, let’s look at the difference between these types of instruments. An acoustic piano is the classic mainstay of the instrument, existing for hundreds of years and played on by the greatest of composers. They are upright and always contain three foot pedals: a soft pedal, a sustain pedal, and a middle pedal, which leaves the pressed keys sustained, but not the keys played after. They are almost always 88-keys (7 octaves), leaving every song playable (depending on your skill level, of course). They tend to be more on the expensive end, due to the complexity and detailed craftsmanship of the instrument, as well as the quality of the materials. This is the broadest category in the group of instruments. This instruments can range from 25-keys all the way up to 88-keys. Some are upright and some are flat, needing something for them to rest on. If you’re at home and want to sit while playing, a specific seat for these instruments will suit you great. If you’re interested in performing live and possibly want to stand up while, playing, you’ll need a stand that raises to the height of your choosing. These types of instruments offer a huge range of capabilities, such as pitch and octave control, instrument sound, and even may offer a metronome to practice your rhythm and timing, an internal drum machine, turning the keys into specific drums. Some even have a bank of background songs and drum patterns where you can play along to them. Synthesizers are all about manipulating sound. EQ, waveforms, and many different effects like delay, reverb, and distortion may be available to tweak to the exact way you want. Some synthesizers are made more for live performance, while some are strictly MIDI, meaning you will be manipulating the sound inside your computer only (although some you can do both). Some have multiple faders and knobs, leaving you extra control over your sound. This especially comes in handy for a live performance if you prefer to not have a computer on stage. You can do these adjustments straight on the front of the synthesizer. How many keys do I need on my piano or keyboard? This essentially depends on what you want to play. If you’re looking at a MIDI synthesizer where you will be inputting all of your playing to the software inside your computer, you may only need a 25-key model since you can edit your compositions inside your audio editing program or digital audio workstation, also known as a DAW if you’d like. It can save space and even leave you with more versatility in your DAW, moving around notes and chords in your program. Basic beginner keyboards are very inexpensive. Although without the bells and whistles, they are great to start learning scales, chord progressions, and new songs. The Casio SA-78 Mini Keyboard is the best choice for children, as it has smaller keys and also includes drum sounds, so your child can have fun playing drum patterns all in one. The Casio CTK 1300 is a 61-key full sized keyboard with 100 built-in rhythm and 100-built-in sounds. The Yamaha PSR S670 Digital Keyboard is one of the best you can get for the price range, and if you order from Musikshack, you will also receive a free case for safe portability. The Yamaha Tyros 5 61 Key Arranger Workstation is top of the line. If your order on Musikshack, you will also receive a set of free speakers and a stand. For stand alone keyboards, you might want to consider a keyboard stand, especially for live performance. 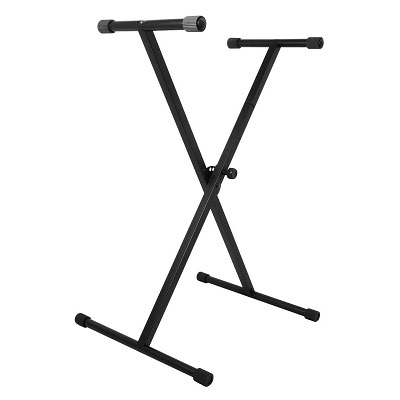 Consider a CA keyboard Stand Single X Type, a great bargain. You might also not be satisfied with using an office chair or living room chair to sit in to play. Piano and keyboard benches, as they are called, are made to sit in the correct position. Some are even adjustable in height, so you can find the right height to play so you don't strain your wrists during performance. If you’re purchasing a keyboard or digital piano, many models do not come with the traditional upright acoustic piano effect pedals. A footswitch/pedal can emulate not only the effects on an acoustic piano, but you can also use the pedal to trigger any effect available in the keyboard. 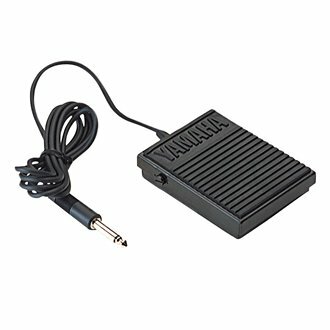 The Yamaha FC 5 Foot Switch is another great bargain. For traveling, you might consider a case if you don’t want dings and scratches on your instrument. Musikshack has its own brand of keyboard cases in two different sizes. Both products are lined with thick nylon foam padding and include a separate pocket for storing adaptors, cables, pedals, or even music books if you’d like. If you’re looking for a synthesizer and are considering producing music inside the digital audio workstation on your computer, you’ll need a specific connector to hook up your synth to your PC or Mac. A MIDI to USB cable will accomplish this. The MIDI side connects to your synth and the USB side connects to your computer. The Yamaha UX16 USB MIDI Interface is a high-quality USB-MIDI interface. With so many options available in this field of instruments, find what is exactly right for you.